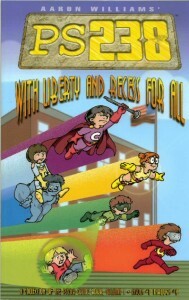 Our next Comic Book Club podcast will focus on PS238 Volume 1: With Liberty and Recess for All, by Aaron Williams. This book is about a school for superpowered kids, and we’re looking forward to hearing everyone’s opinions about it. We’ll start with Volume 1, but since some of us have already read ahead several trades, so we’ll be happy to talk about the entire run so far.